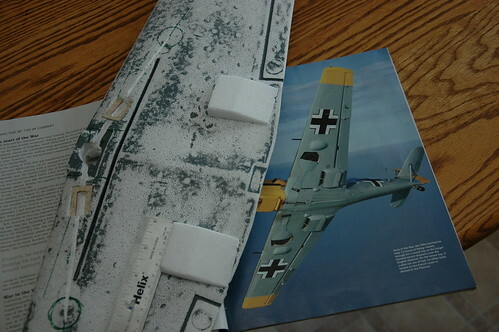 One of the distinguishing features that is missing from the original GWS 109 model is the under-wing radiators. I decided that I'd give making some a shot. 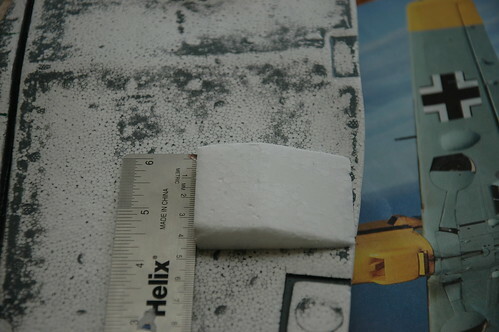 I had a peice of packing foam that was about the right size, and after examining some reference photos that I had I carved some squares out. I haven't attached them to the wings permanently yet, since I want to do it after I put the fiberglass on it. I'm probably also going to trim them down a little bit to keep them from interfering with the aerodynamics of the wing too much.